This post won't be about spoilers ~ God knows, I didn't understand much aside from the basic plot. BUT, Junno was right when he claimed Tatsuya is now Ueda-sama. Really. Tatsuya gave a splendid performance in his scenes. His initial scenes started out with him being all playful and bubbly as we well know him to be at times. I found myself just wanting to jump up and give him a 'bear' hug (grins) I was in Row G and the theatre was small, so I was very close to the stage seeing his every changing facial expressions~ and what a beautiful man he is... not just him, but his acting. KAT-TUN biased aside, I was really captivated with his wide grins and his eyes and how he expressed and emphasised his emotions using his entire body. In his latter scenes, his character completely changed. His character was like this perfect mad man on stage. He used his whole 'self' to convey his character's emotions. He did some really crazy things with his eyes and his expression kept changing to show how badly his fiance's affair with his brother devastated him. His hair was all messy and he really looked like a raggedy man about to jump off a cliff. His acting made a tragic scene looked beautiful and I was beyond impressed at the lengthy soliloquies/monologues he had to deliver. I think it really takes talent and hard work to have a stage alone and talking for over five minutes (alone) at an amazing speed, and yet making it so captivating. He was sweating and all from all the emotional and physical antics he was doing. He was the last of the casts to come on stage and the audience stood and cheered: he got the longest and loudest applause. The entire butai lasted from 18:30~22:10 (approx. ), and at first I was disappointed when I heard from other fan reports that he wouldn't appear in all the scenes, but after watching, that might have been impossible. Too many things were happening with too many people plus the setting of the butai was split into different era all the way back to 300 hundred years ago, plus the present and the in-between. Oh, something else to appreciate about the butai, is that even if you don't understand much, the theatrics and costuming were very well done and they had a bit of visual comedy to balance the different moods happening. Really captivating, so the time went fast. I couldn't believe how much the time had fled when intermission came almost two hours after it started. Anyway, I kept thinking that definitely, the stage is Tatsuya's to control and make his own. I also now wish to see his Romeo and Juliet. But I suppose that now, with this exposure, he might be back on stage nearer in the future than 2009 til now. Well, it was a pretty interesting report. And for that person and her two other japanese friends as well, it was apparently pretty difficult to understand the whole plot even though it was very nice to see. I saw a few weeks ago that someone assisted to two representations of him. I read that report. But wanted to know why you said 'assisted two representations of him', but I guess you meant 'attended' two shows. Sorry. got a bit confused since I was talking about this dual personality and all. But *sighs* dazzling Uepi is something I'd really love to see live. *___* wish you were there! Sounds like it was really good, and Ueda was really good. I'm so happy he seems to be doing well and is getting a lot of praise for his work. omg you went to Uepi's stage?! uwa sugoi!! you're so lucky *O*!! Lucky!!!!! haha yeah I was. It was great. I didn't think I would've been there but it then it happened and I was just screaming inside. keep enjoying dear >w< !! Good to still see that you're around. 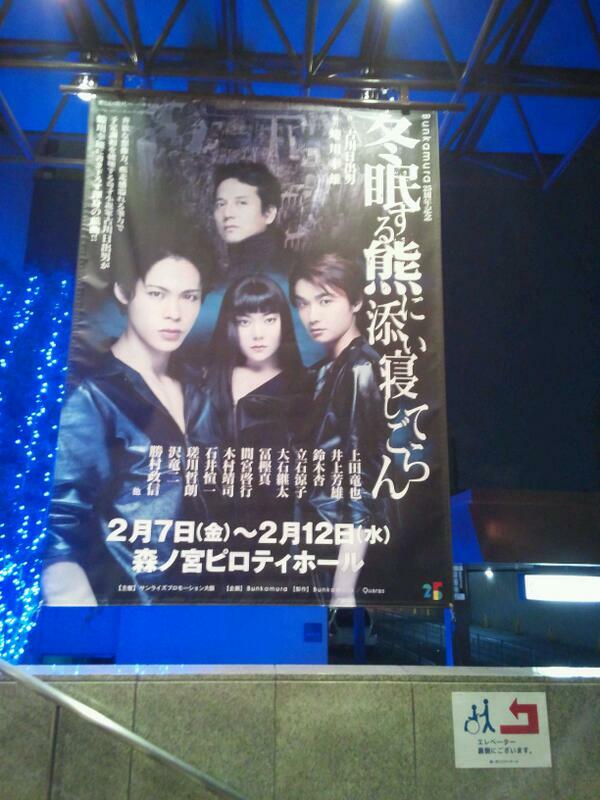 Yeah, lucky me to have seen this play XD Ueda was really kool and should definitely get more opportunities like this!